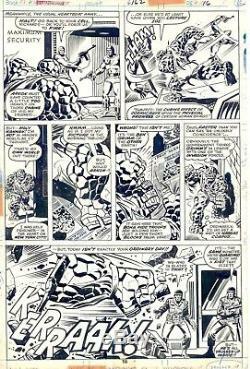 Fantastic Four #162 page16, pencils by Rich Buckler and Inks by Joe Sinnott. Nice bronze age page from 1975 featuring the Thing (well, Thing-Richards from a different reality; or somethin' like that). Minor use of whiteout for lettering corrections in a couple panels. Low feedback or zero feedback members, please contact me first before purchasing. The item "Fantastic Four #162 pg 16 by Rich Buckler and Joe Sinnott" is in sale since Wednesday, August 8, 2018. This item is in the category "Collectibles\Comics\Original Comic Art\Interior Pages". The seller is "ucleben" and is located in San Jose, California.